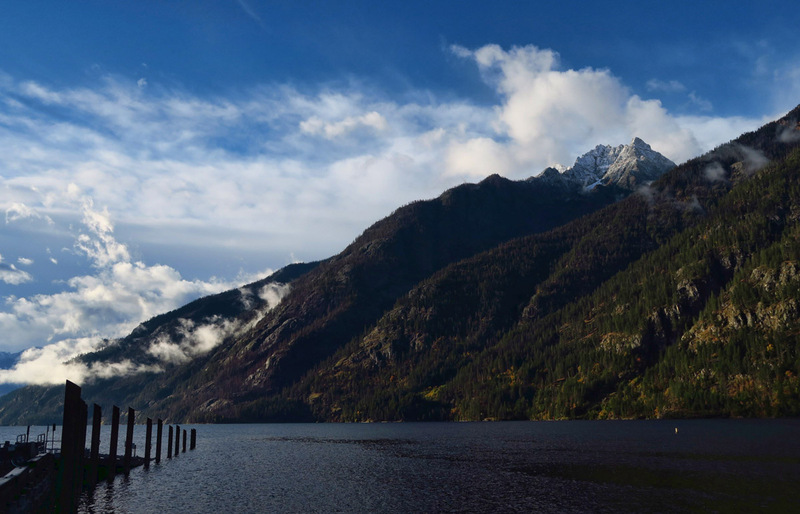 Parting clouds reveal a gorgeous view from North Cascades Lodge. Looking down the valley as clouds lift over the Cascades. The lodge offers the option of a restaurant serving nightly specials and specialties. We both opted for the house specialty of Bacon-wrapped Meatloaf over Garlic Mashed Potatoes. Wine was available, but unfortunately “the hikers drank all the beer.” They were waiting for the next shipment…such is life by boat delivery. 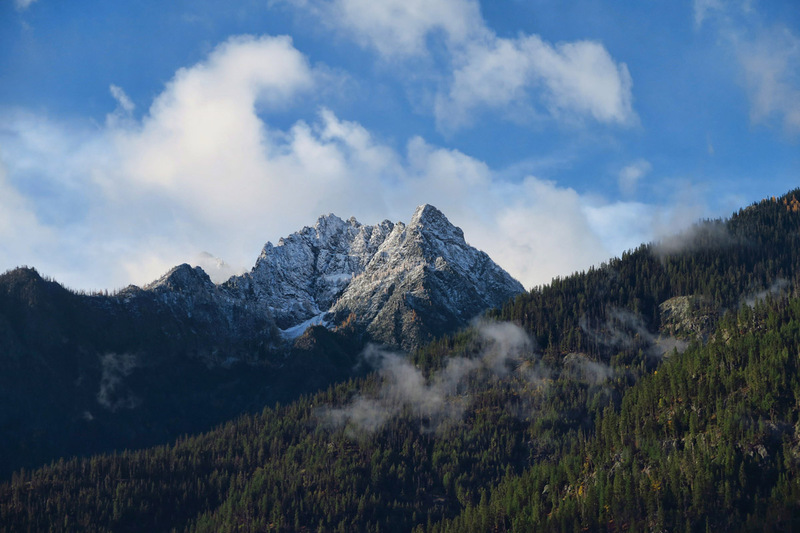 The evening entertainment was an excellent talk by the Ranger on “Fire and Ice,” the impact of climate change on the glaciers and forest fires of North Cascades National Park. 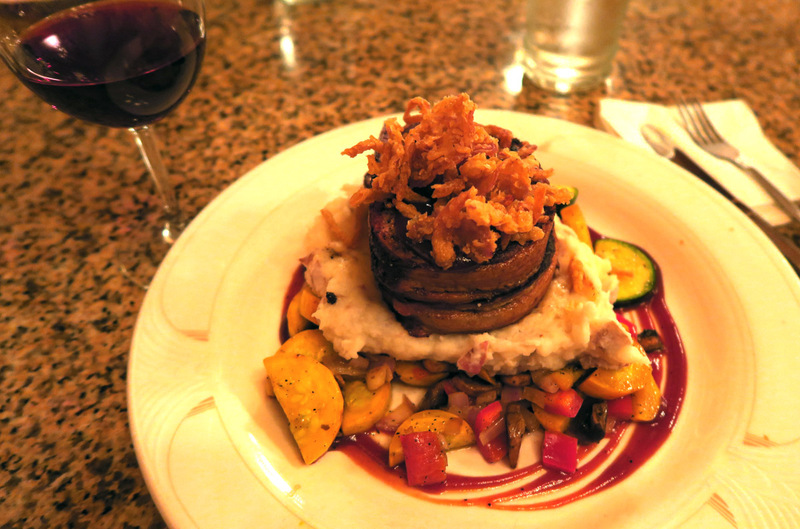 One of the specialties of the North Cascades Lodge Restaurant, Bacon-wrapped Meatloaf. 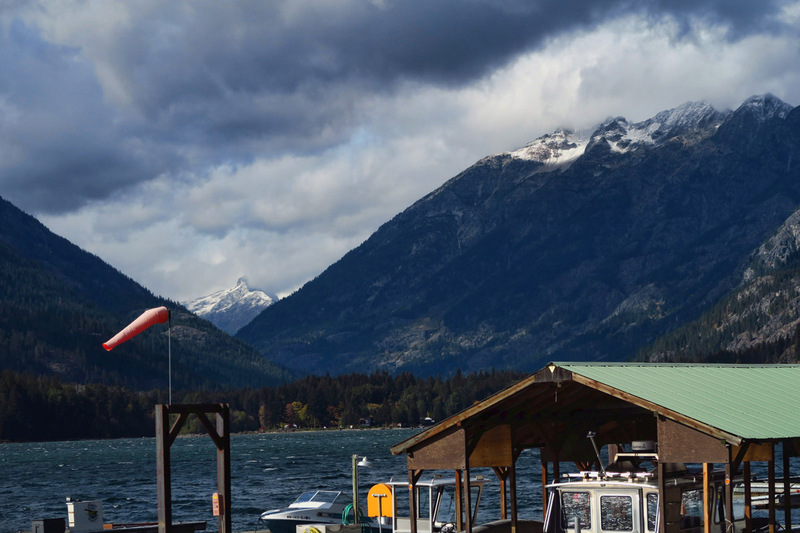 The weather forecast called for rain the entire second day of our visit to Stehekin, but what a pleasant surprise to not only awake to blue skies, but also a dusting of snow on the Cascades! 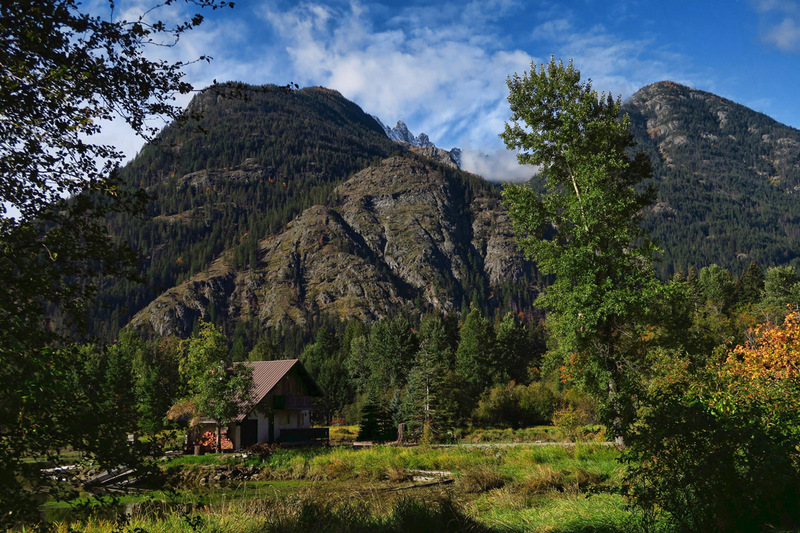 The morning air was brisk and breathtaking, cold enough to feel like fall, but still warm with sunshine on my shoulders as I sat and watched the clouds part over the rugged mountaintops. 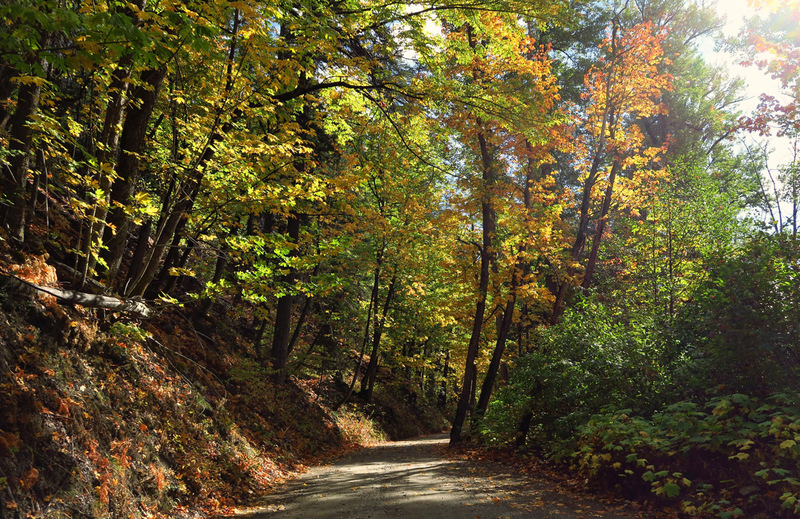 The only road in the village is paved for 4 miles, and runs alongside the lake. Gravel continues on for another 12 miles. 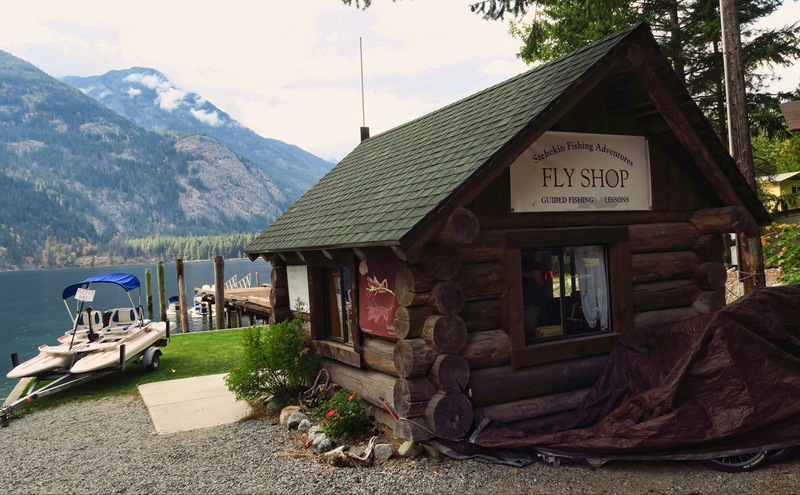 The Fly Shop is a one-stop shop in Stehekin, offering fly fishing tours, boat rentals, log cabin rentals, etc. 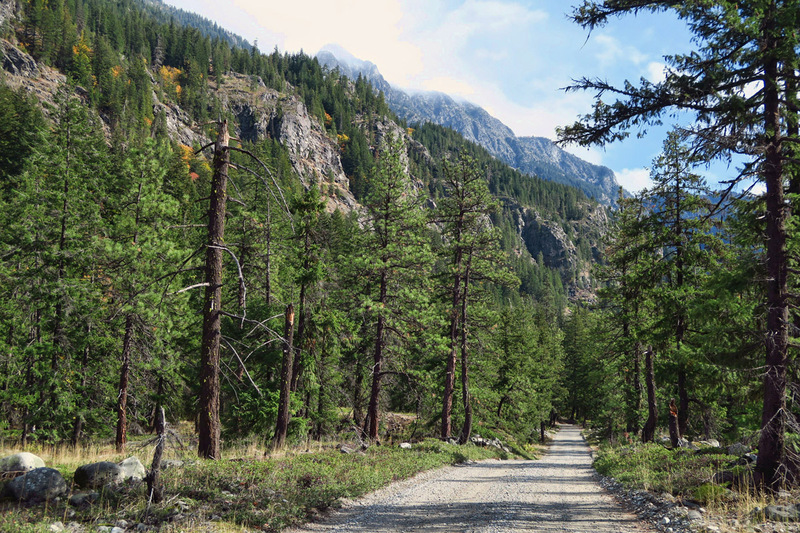 The Stehekin Valley Ranch offers “glamping,” or tent cabins. 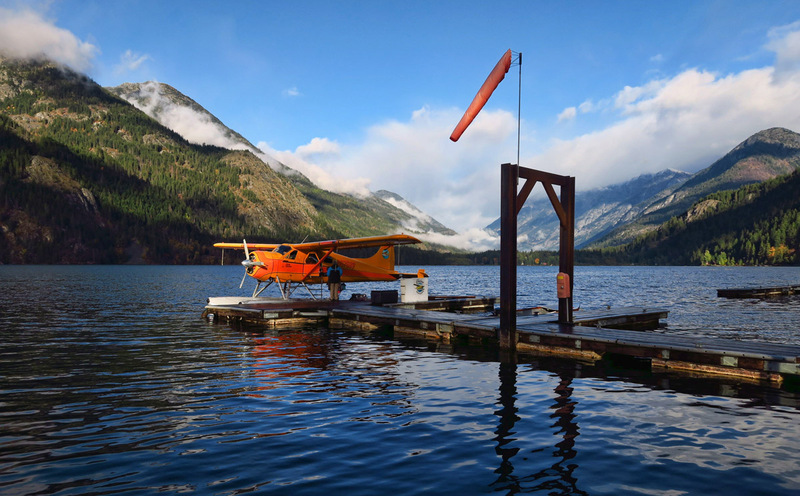 When I first learned of the village accessible only by boat, hike, or float plane, I got the impression there were no vehicles here. But that’s far from true. There are many trucks and vans in the village, and in fact, some accommodations come with their own transportation. Bikes can be brought aboard the Lady of the Lake for a fee, or there are bike rentals available. 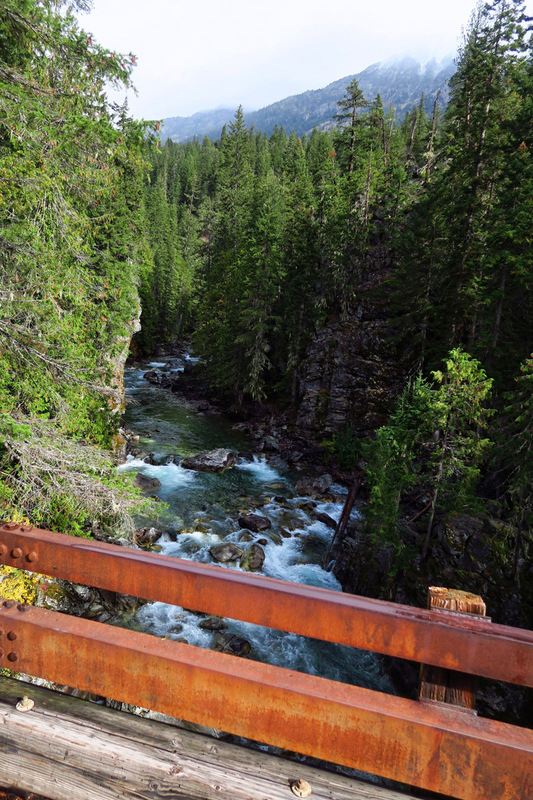 But with limited time, biking does not afford the opportunity to explore as far as we wanted to go. 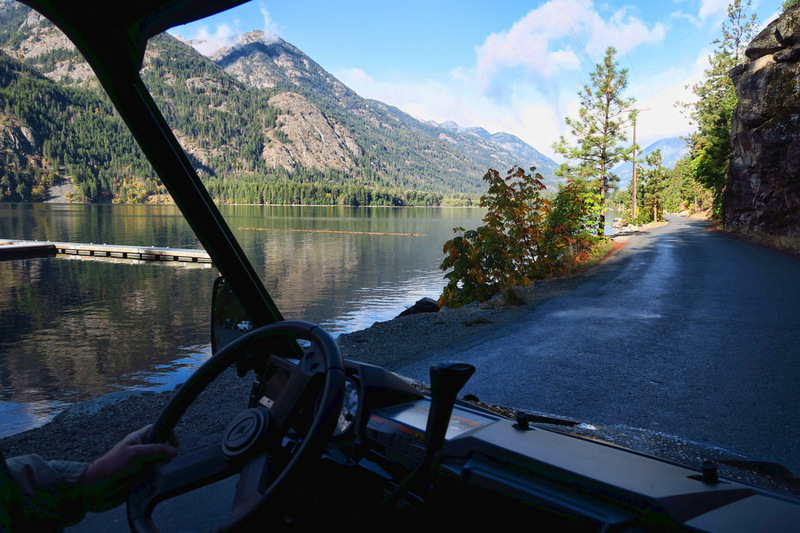 Turns out, there are only two motorized vehicles for rent in all of Stehekin…Polaris Razors. 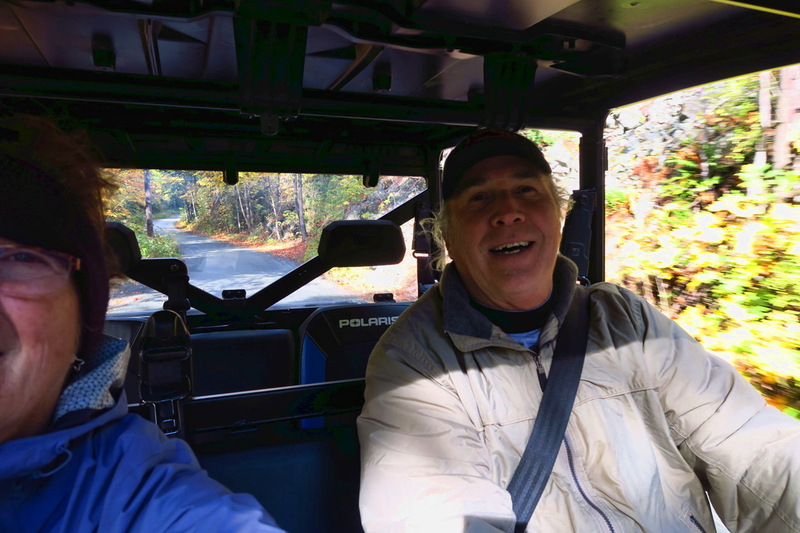 Why do I feel like I am eight years old again, riding in Don’s Go-Cart? 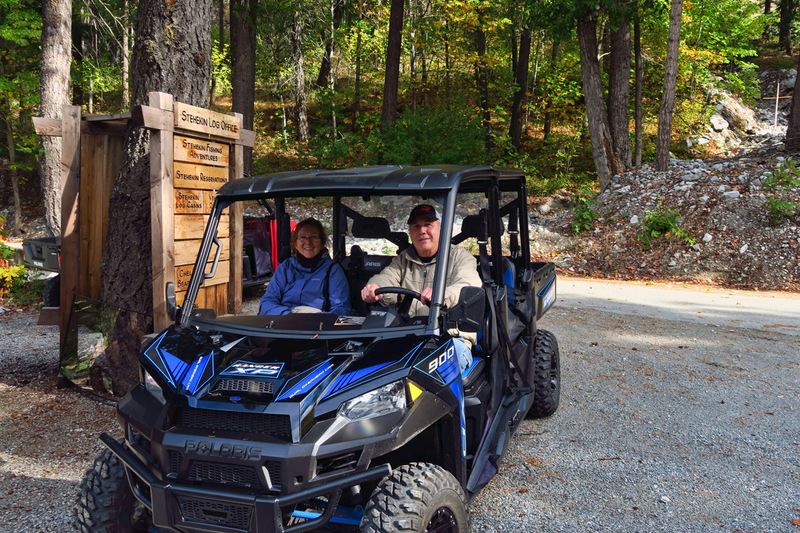 The Polaris Razor, or souped up ATV, is to the hiker what jet skis are to a sailor. I have vowed in the past to never make eye contact, let alone set foot in one. Yet here I was, trying to convince Don that paying $65 for two hours to rent what I have previously called “a blight on the landscape of humanity” had even me surprised. Exploration is a relentless addiction. 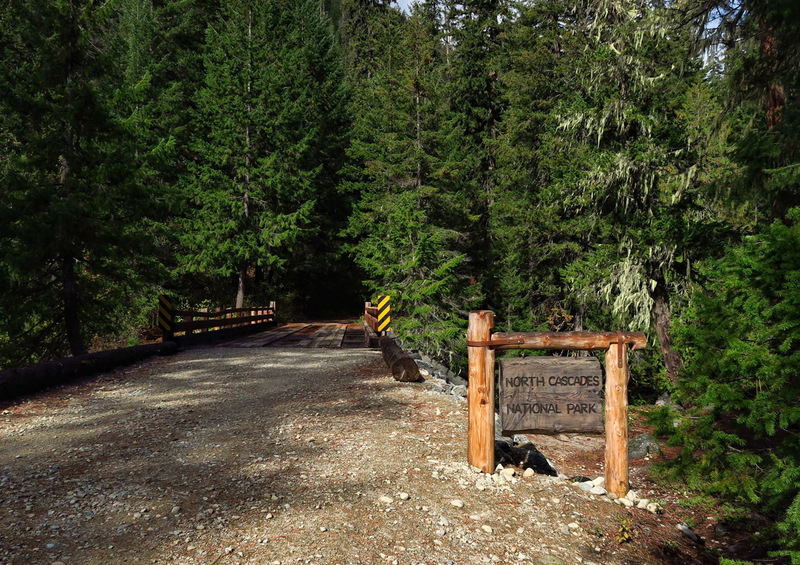 The gravel road extends 2 miles beyond the park boundary. 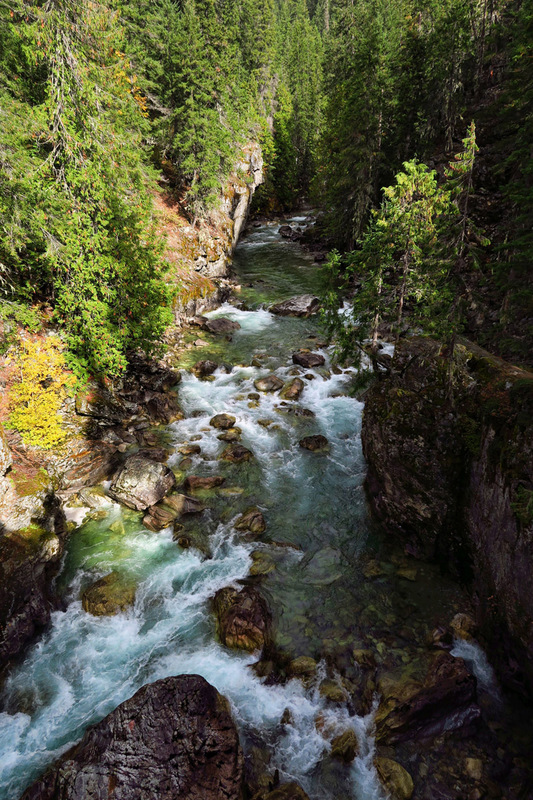 The beautiful wild and scenic Stehekin River. 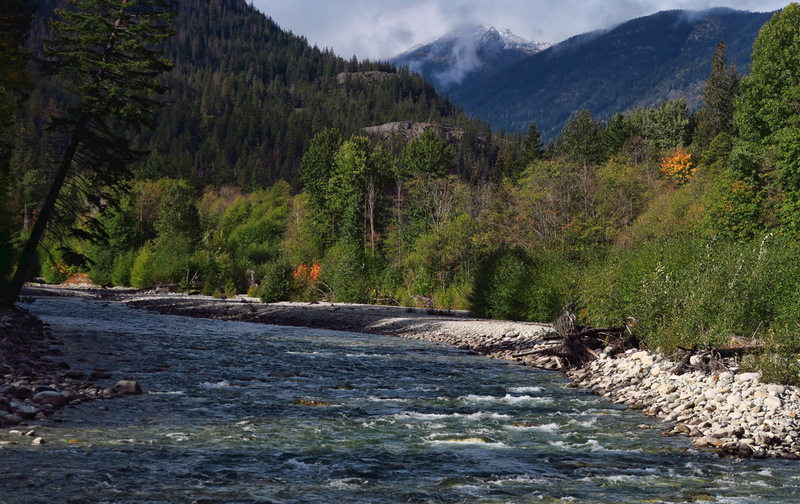 All those dark red dashes in the water are Kokanee, or fresh water versions of the Sockeye salmon. The Razor, crossing the Harlequin Bridge. 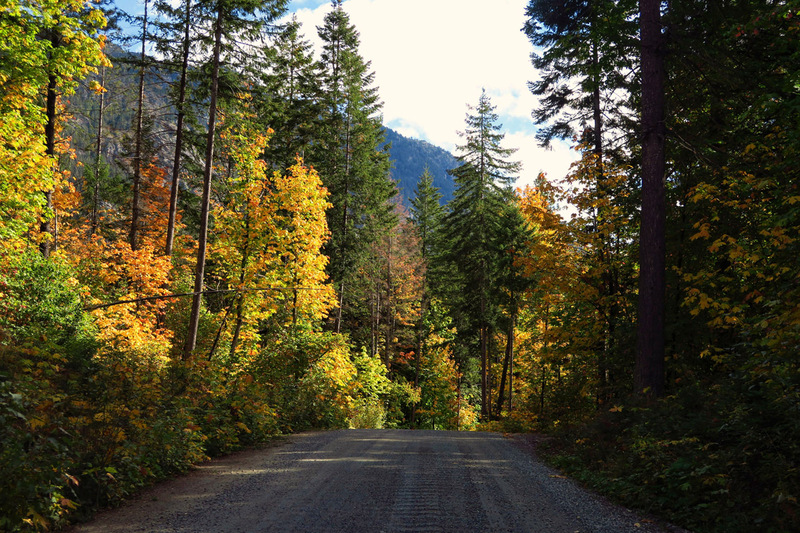 The Razor has no windshield, but even at a slow speed of 25 mph, it’s like speedballing autumn-scented pot potpourri infused up the nose, alternating fresh pine and fir with the sweet, musty smell of wet leaves. I can’t imagine a better high! 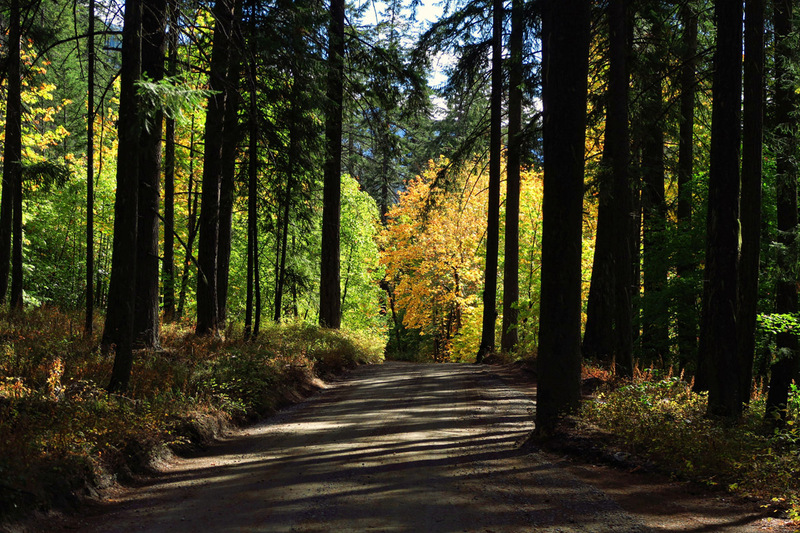 …and lush forests smelling of pine and fir. Sliding in to return the rental with minutes to spare, we retreated to the Lodge game room overlooking the boat dock to await the return of the Lady of the Lake II. 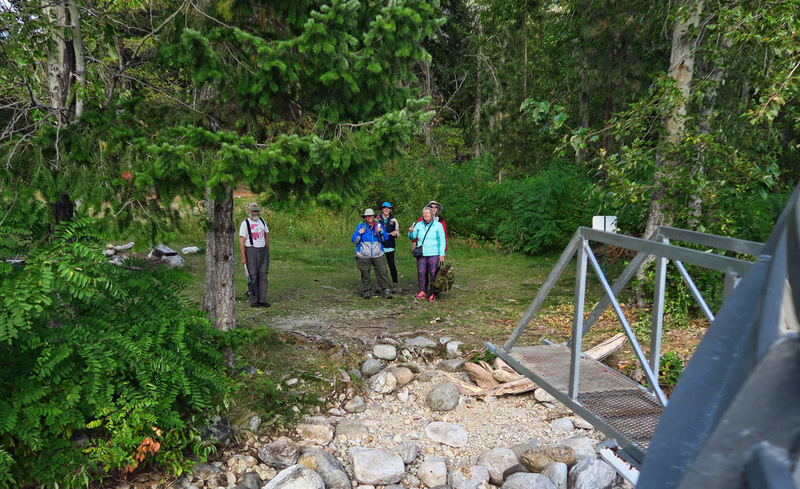 Also in the room with us were several PCT hikers, waiting on their resupply boxes to come on the boat. 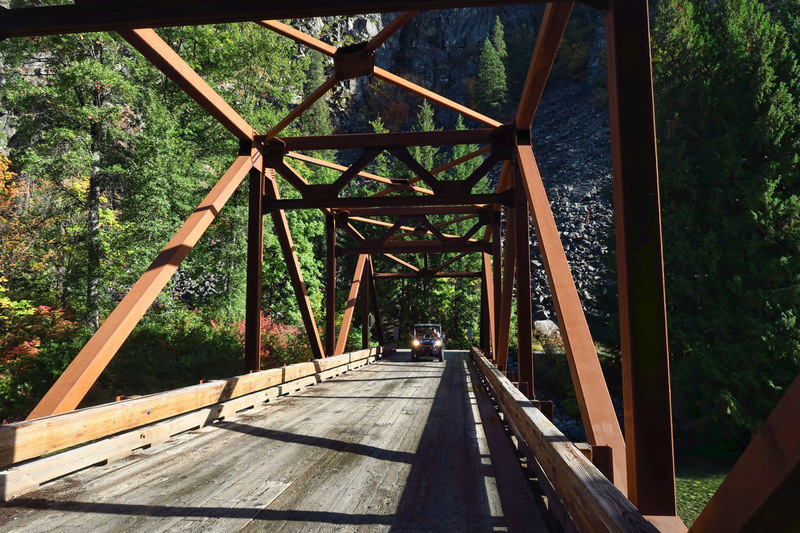 Now within only 88 miles of completion of their incredible 2,650 mile journey begun back in mid-May, they told entertaining stories of memorable moments on the trail. 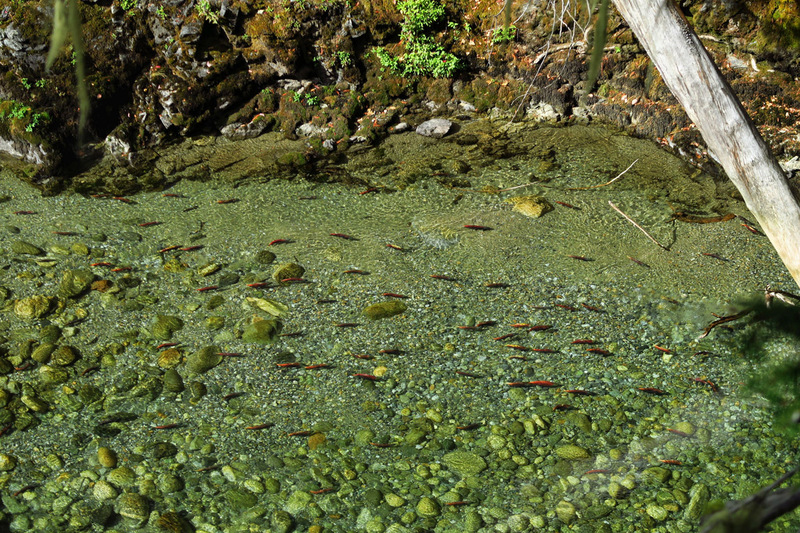 More dark red dots below are Kokanee salmon spawning. 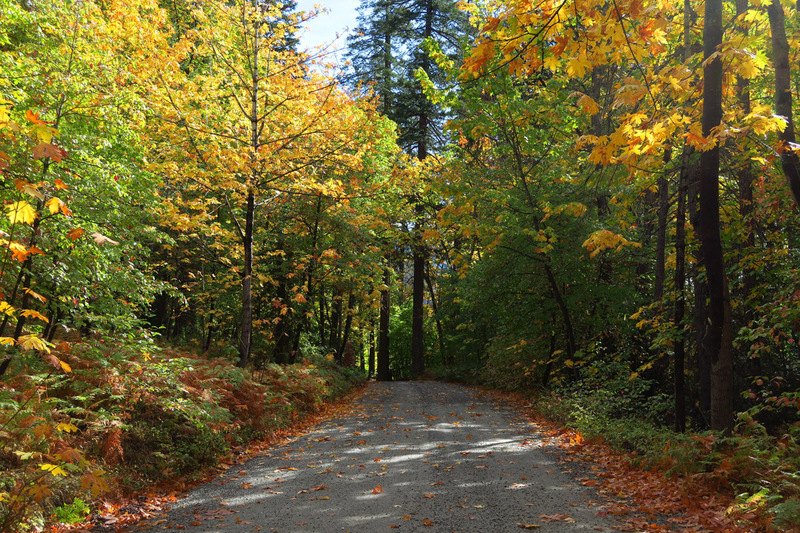 The PCT intersects near here. 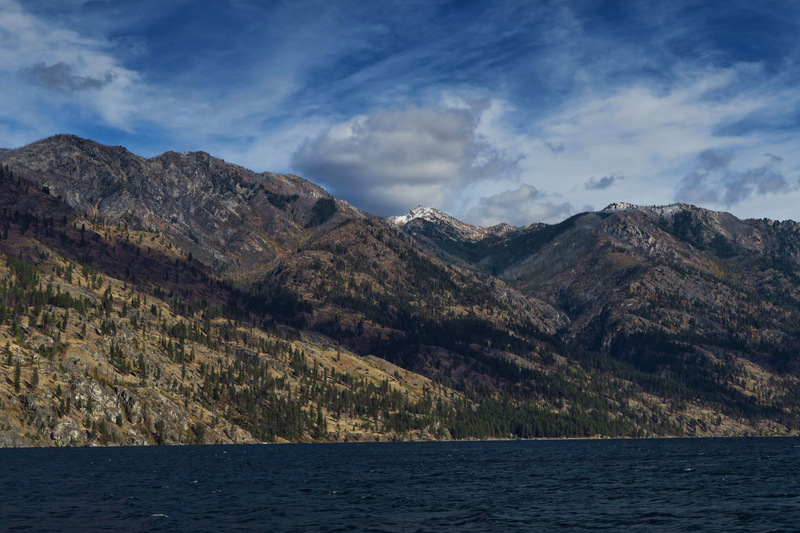 The ride back “down lake” to Chelan was downwind all the way with the sun lighting up the snow-sprinkled Cascade mountains, as they gave way to the vineyard-covered foothills, now cast with long, end of day shadows as we neared Chelan. As we disembarked, we both agreed the only thing that could have made the trip any better was to stay longer! 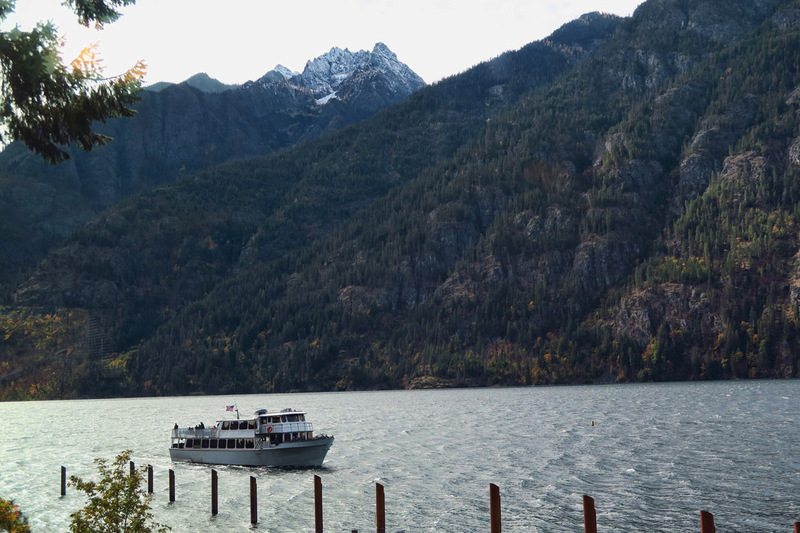 I found out too late that one can arrange for the boat to stop and pick up hikers at Moore Point, affording a 7 mile hike from the Lodge. A “plank” extends from the bow of the boat for boarding. 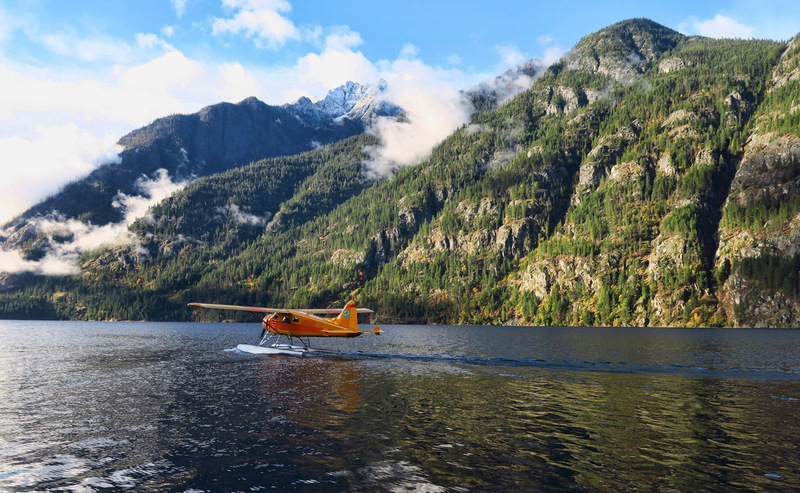 This entry was posted in National Parks, Washington and tagged Lady of the Lake II, North Cascades Lodge, North Cascades National Park, Stehekin River, The Fly Shop by Suzanne. Bookmark the permalink. 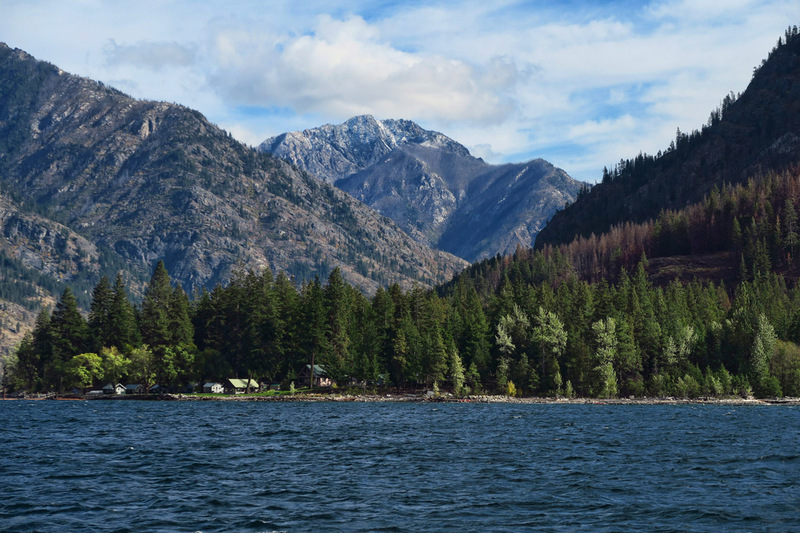 Thanks for bringing back great memories of Stehekin! Friends used to live there with their two kids so we visited them three summers in a row. 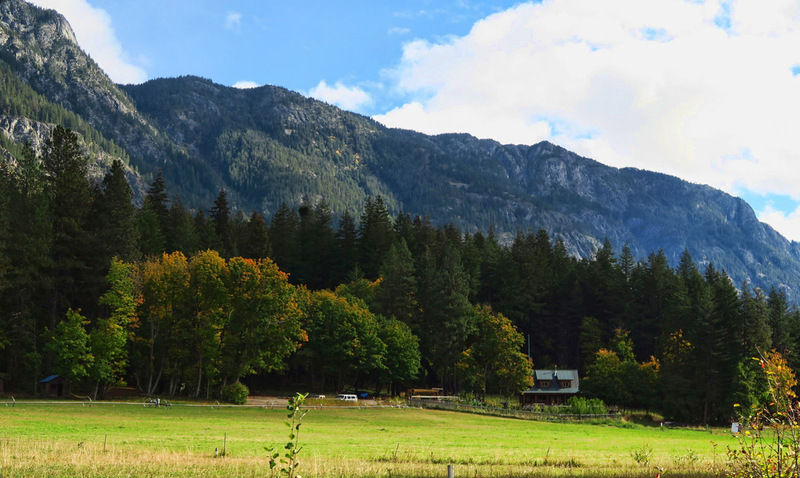 They moved to Lopez Island when the kids reached high school age as the one room Stehekin school house only went to 8th grade. Glad you enjoyed the beauty of that unique area! 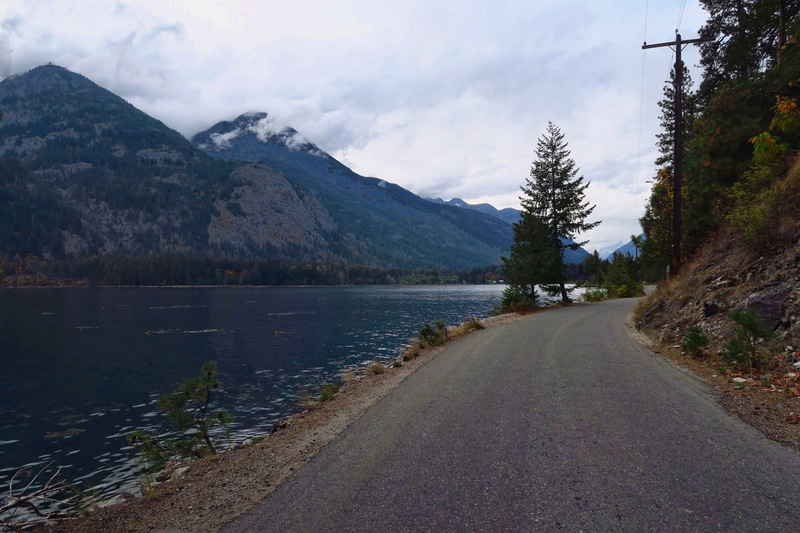 Wow, living in both Stehekin and Lopez Island…they were living right! Thanks for following along, Marti. Another awesome trip, thanks for sharing. Looks amazing. 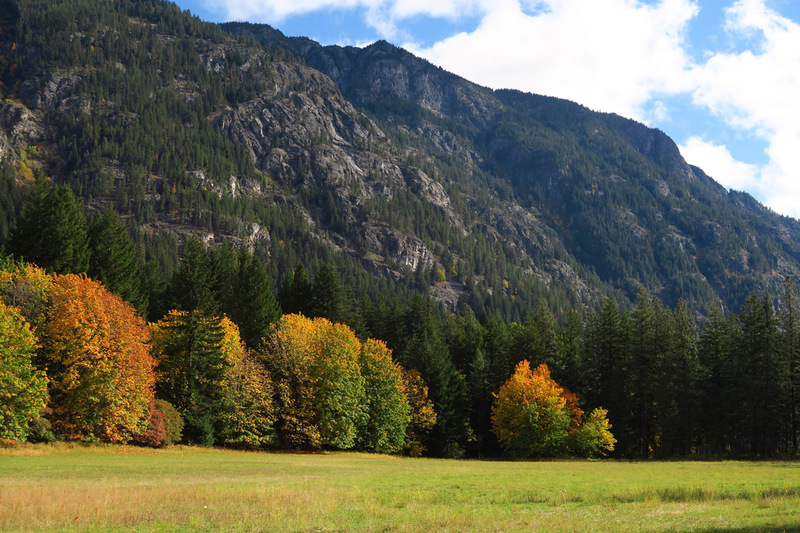 We drove right by this summer going from Leavenworth to Winthrop. A magnificent trip! Certainly worth the Razor ride. Those fab smiles from the Razor – oh my! What a wonderful adventure!! Thanks for sharing. 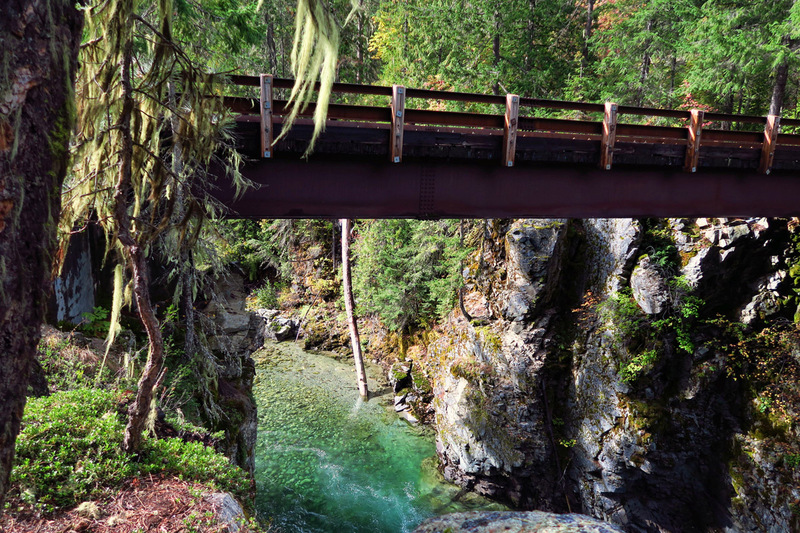 Beautiful shots of the fall colors and I absolutely love the shot of the salmon from the bridge! 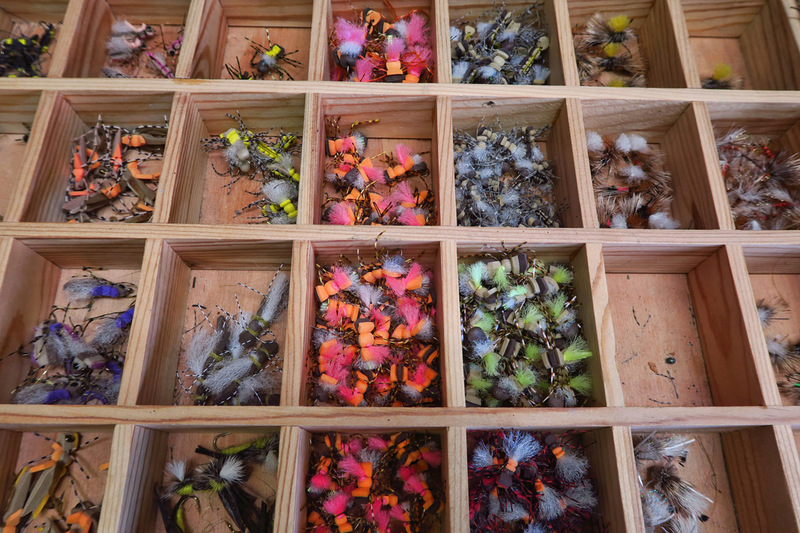 We have many of those flies that you pictured in that one shot from the fly shop. 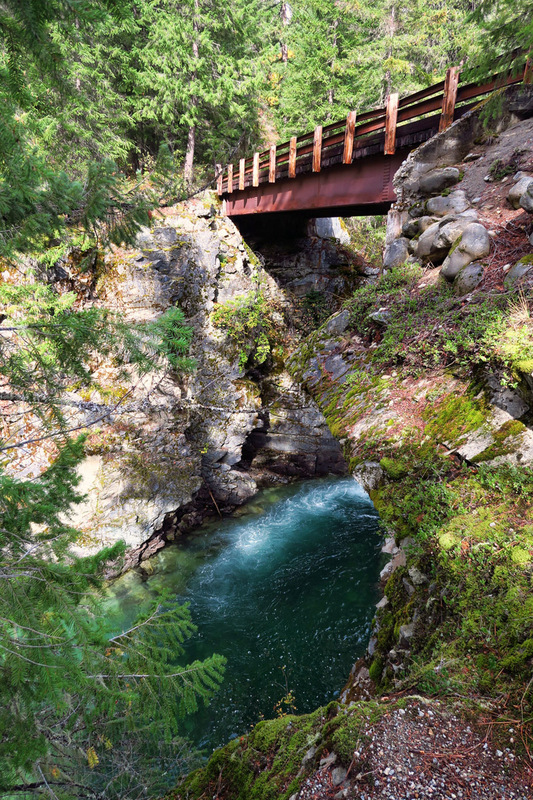 Looks like a great place to go for hiking or just relax and enjoy the scenery. What a fun splurge! And very cool you got to share it with Don. 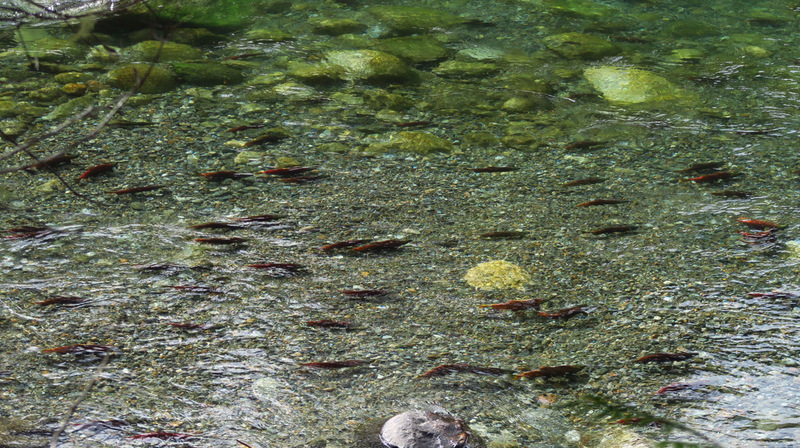 So neat you got to see some salmon doing their thing. It may have been a short stay but it looks like it was worth every penny and minute! Pretty sweet, my home base….Eh?? 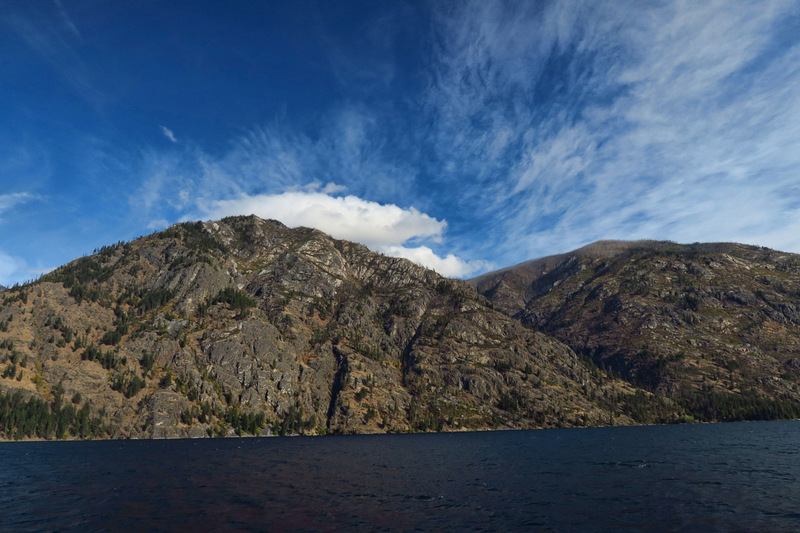 I had never heard of Stehekin but it looks like a great place to explore. You look like an excited kid in that Razor. What a way to travel!